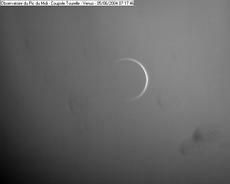 La Palma, (Spain) Venus - now almost with a "ring"
Latest Comment (June 5, 08:30 UT) : An image of Venus from Pic du Midi Observatory (middle) now shows a not-yet-complete ring around the planet - this is caused by diffraction in Venus' dense atmosphere of the sunlight. 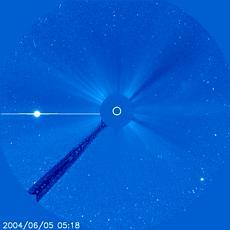 Venus is visible in the image from SOHO-LASCO (right), to the left of the Sun. The three images now shown are only being updated intermittently at this moment. 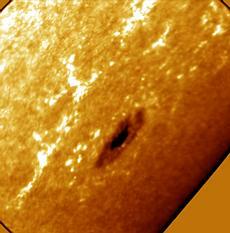 The display above (calculation of the AU) has been activated, but for obvious reasons, no timings from the transit in 2004 are yet available; those from 1874 and 1882 are used instead as example. The number of participants registered with the VT-2004 Observing Campaign (top line) is the current one.